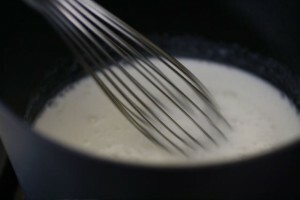 Panna Cotta is traditionally made with cream. This version is made with non-fat Greek yogurt and non-fat kefir. Last July I found out I needed to lower my cholesterol, since then I’ve really enjoyed researching and creating heart healthy dishes. 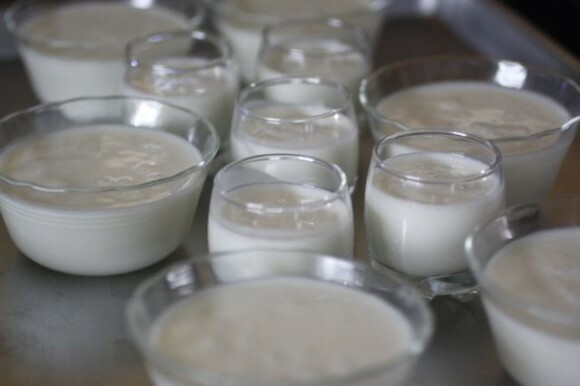 This fat-free Yogurt Kefir Panna Cotta recipe is healthy and versatile. Top with fresh fruit, fruit coulis, preserves, premium gourmet honey or olive oil! Are you wondering why bother to make a fat-free dessert then add olive oil? The unhealthy saturated fat and cholesterol are removed and replaced with healthy monounsaturated fat. And it is fabulous! 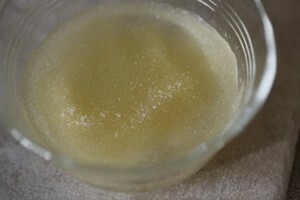 Sprinkle gelatin over 3 T. cold water, stir and let stand until softened, about 5 minutes. Heat kefir, sugar and salt over low heat. When sugar has dissolved, remove from heat, add gelatin and vanilla then stir. Let cool slightly. Gradually whisk the warm kefir mixture into the yogurt. Pour into ramekins or amuse bouche cups. Let come to room temperature before covering. Chill at least 6 hours. I’m in love with these 2 oz. amuse bouche cups. This small portion is perfect for the olive oil panna cotta. Simply drizzle a small amount of top-quality fruity olive oil over the top, add a sprinkling of sea salt and fresh thyme. Unusual and intriguing, this version rocks! 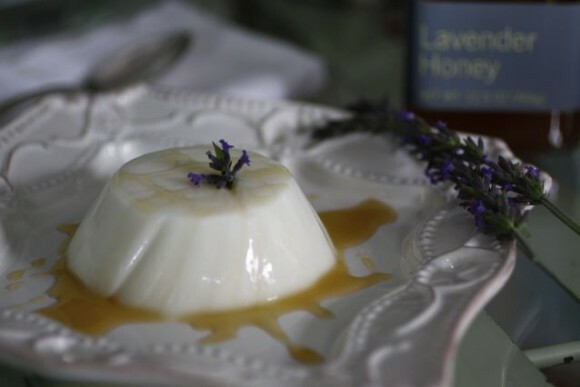 To make an elegant and completely fat-free dessert, simply drizzle lavender (or another monofloral) honey over the inverted panna cotta, garnish with lavender flowers. Both versions are heart healthy, totally satisfying and terrific for entertaining. Not convinced? We make a delicious whole milk/heavy cream version with a pomegranate reduction, that recipe can be found here. I am completely in love with this recipe! #1: I’ve made panna cotta before (the unhealthy way) and found it delightful (of course) but lightening it up is exciting. 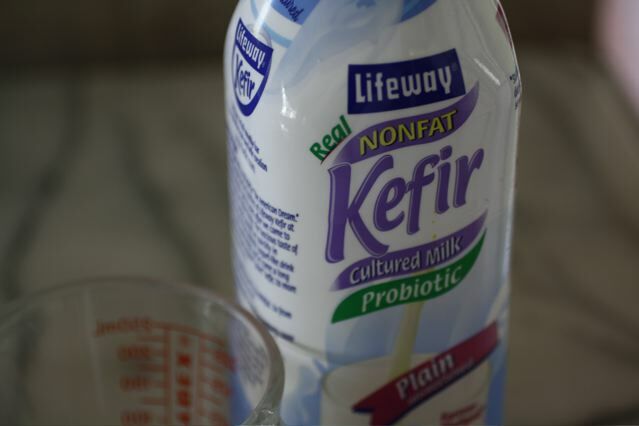 #2 I love kefir! I’ve never bought it before choosing always to make my own, but it takes a lot of forethought as it needs to set on the counter for 24 hours and then be in the fridge for 8 hours after that before using. I’m glad to hear the store bought kefir is good. Hi Amanda – the store-bought kefir is really good. And this heart healthy recipe worked, so I was excited about that. 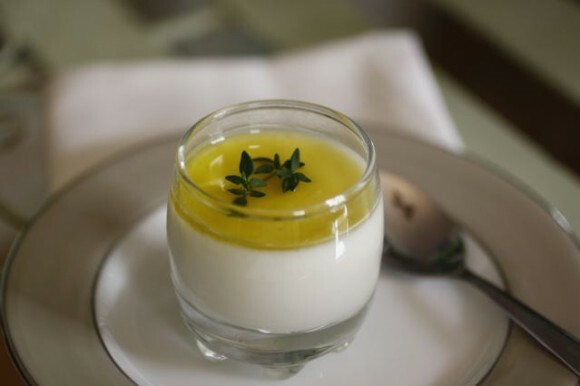 These two panna cottas are elegant and sophisticated. I’m intrigued with the idea of drizzling olive oil or lavender honey. Marvelous! I never thought of drizzling panna cotta with olive oil, but I absolutely love the idea, and can’t wait to try. I’m going to do this over the weekend. I am trigued by the olive oil and sea salt – loving the honey. Think vincotto or a good balsamic must slightly reduced, wine jam – there is so much you can do. And it is beautiful. Sigh. This will be a very sweet project. Is the consistency like a flan? It looks really good. Hi Zara – yes it is, and delicious! How gorgeous! I’ve been meaning to make panna cotta for ages now and this is just the inspiration I needed – thank you! Oh I just love the lavender honey! 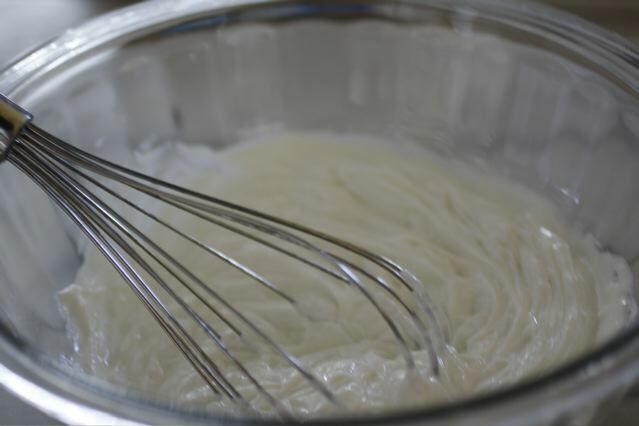 I love making panna cotta and I loved the flavors that you have paired with it!!! Very elegant little desserts! Ooh, controversial recipe! Well, maybe for me – had a not-great experience with jellied skim. 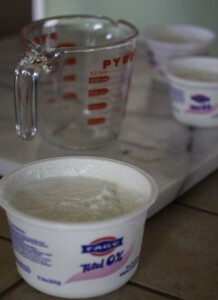 But kefir and yogurt seem to offer almost the same voluptuousness that cream has. Plus there is the olive oil – great addition!! Thanks Doctor – I am definitely watching my cholesterol and healthy oils. It’s actually fun. Lori Lynn, this is my favourite kind of panna cotta. Just as you’ve used greek yogurt, I had something similar in Greece…love the slight tartness balanced with the sweetness. I take small spoonfuls and let it melt in my mouth. Oh if my hubby comes and looks over my shoulder right now I am so in trouble! Wow, these look really good! I am intrigued by both! What a lovely creation. It looks magnificent and I bet it tastes so delightfully unique. Looks delicious…both ways. i have never tasted olive oil with panacotta…sound interesting and different! The dessert screams elegance and sophistication..who would ever think they are also somewhat healthy? I love the finishes of olive oil or lavender honey. I am totally in love with your photos of this lovely creation! The new blog format is so very elegant too. 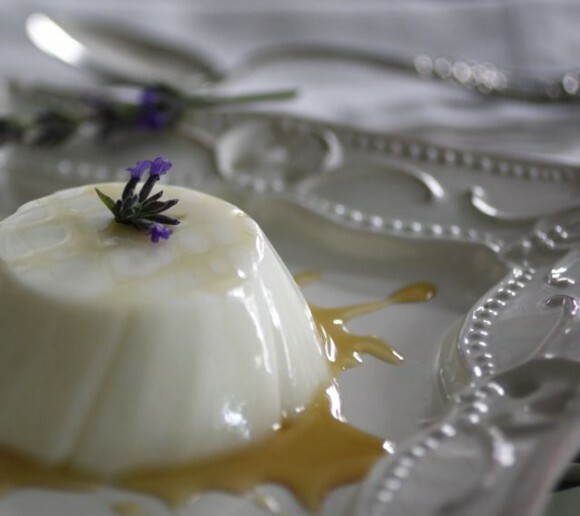 What a beautiful panna cotta – and fat-free too! I would love to taste this unusual combination. This looks wonderful, Lori Lynn. I love that it is fat free. I actually have some Stony Field Farm fat free yogurt in the fridge now. Hmm…. 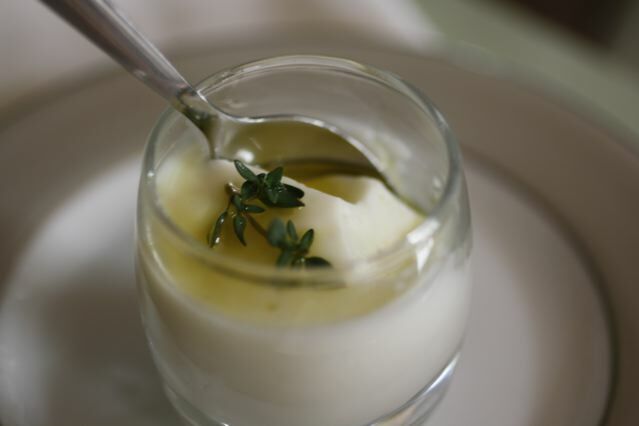 Love the idea of topping a panna cotta with olive oil and salt. Great idea! Yum! I love Kefir and have been drinking it since a little girl! It’s so good to see your use of it here! Very delicious and healthy Lori! I have made this for my son’s birthday (he wanted a healthy dessert and these are stunning). I would love to post this on my examiner site and link to you. I had some changes – less sugar and used vanilla yogurt – so didn’t add vanilla – but I would love readers to see yours. I’ve always wanted to make panna cotta but the cream scares me a little. This sounds fab! Believe it or not I just had my first taste of panna cotta this weekend. It was delicious, but looking at the recipe and all that cream, certainly not something I’d indulge in too often. I’m very curious to try this version now! I’m loving this healthy version LL. I very rarely trust anything that is non-fat and I have never heard of kefir, but I do trust you, especially since you perfumed the pannacotta so delicately with lavender honey. The lavender blossom garnish is stunning – makes me want to take up watercolors (I should learn how to draw stick men first, perhaps).